Tommy Smith is best known as a prolific jazz saxophonist and educator, but he has had a long association with classical music too. He produced his first classical compositions in 1990, and has worked with the BBC Symphony Orchestra, the Scottish Ensemble and the BBC Scottish Symphony Orchestra. At the heart of this CD is Smith's composition Jacobite, a major work for a large orchestra and saxophone. It is a piece of three movements, 1689, 1715, and 1745, each commemorating one of the major Jacobite uprisings in Scotland. The first movement moves seamlessly to the second, whilst the third stands more apart. 1689 has sections reminiscent of Shostakovich, with ominous, dark chords, and of Stravinsky, the percussive nature of the writing bringing The Rite of Spring to mind. Recurring several times are militaristic snare patterns. There is a sense of menace, though the central sections are gentler, with a feeling of yearning. There is also plenty of space for Smith's assured, fluid saxophone playing. 1715 is more bucolic, though it too has ominous interludes. It incorporates several folk themes played by the saxophone and later different sections of the orchestra. The last piece in the suite is 1745. There is has a sense of foreboding which builds during the piece; an air of sadness haunts Smith's saxophone solo in the middle section. 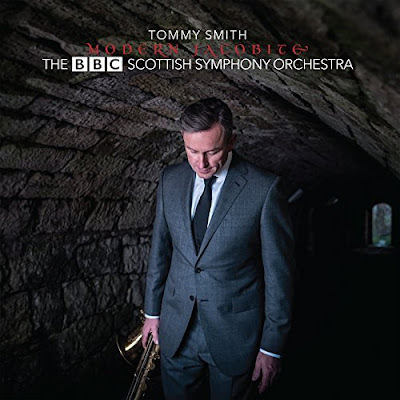 Smith's writing is impressive, mature and confident, integrating the full orchestra: he's as assured writing for brass, percussion and strings as woodwind. His own playing, featuring improvised sections, can be heard to swing, which is not at odds with the orchestra - a rare feat. Either side of Jacobite are two adaptations of others' work. The CD opens with an adaptation of Rachmaninov's Vocalise, originally composed for voice and piano. Smith's arrangement for saxophone and orchestra, predominantly strings and woodwind, is rich and harmonious. Smith's reworking of several of Chick Corea's Children's Songs for saxophone and strings, interspersed with improvisations and his own Bairns Sangs, closes the CD. Smith has recorded Corea's Children's Songs before, including a couple on his 1999 CD of Satie's Gymnopédie. Here he turns them into a significant piece for his saxophone and strings. The short segments run into each other, so it's hard to know where Corea stops and Smith starts, though his Scottish lilt comes through in the Bairns Sangs. They have a light, jaunty touch. The BBC Scottish Symphony Orchestra sound impressive throughout this record, at ease with the material and comfortable with the improvised sections. All round, an impressive performance.